If you are looking for the BEST PRICE for your home, a quick timescale and a smooth sale, or if you are a landlord eager to place your investment into safe and trustworthy hands, then look no further. We are a no-nonsense, dynamic and proactive market leading agent. Our team combines a healthy blend of enthusiastic sales people and experienced personnel with a combined industry experience of over 50 years. Located in the heart of Hillsborough centre, on Middlewood Road, Reeds Rains offers an extensive range of property services to customers throughout the Sheffield area. With such a diverse territory, we have excellent local knowledge and provide a dedicated sales and letting service. The areas we cover are: Hillsborough, Wisewood, Lower Walkley, Oughtibridge, Stocksbridge, Deepcar, Bolsterstone, Wharncliffe Side, Worral, Bradfield, Stannington, Loxley, Parson Cross, Southey Green, Longley, Fox Hill, Malin Bridge, Wadsley Bridge, Chapeltown, Ecclesfield, High Green, Shiregreen, Grenoside, Thorpe Hesley and Wincobank. Looking to sell or let your property in Hillsborough? Looking to buy or rent in Hillsborough? Reeds Rains dealt with the sale of my property very efficiently. I highly recommend the team at Hillsborough. Special thanks to Molly and Claire. Hunting for rental properties can be stressful affair, but Reeds Rains made the whole process as pain-free as possible. Their portfolio of properties all meet a good standard of living. Their staff are professional, friendly, and happy to help. We would like to especially thank Shanon from the Hillsborough branch, for her attentive service. Thank you very much to Shanon for helping me find my new home. You were friendly and helpful throughout the process and always kept me in the loop with progress. Thank you also to Elaine for going above and beyond to ensure the handover went very smoothly! 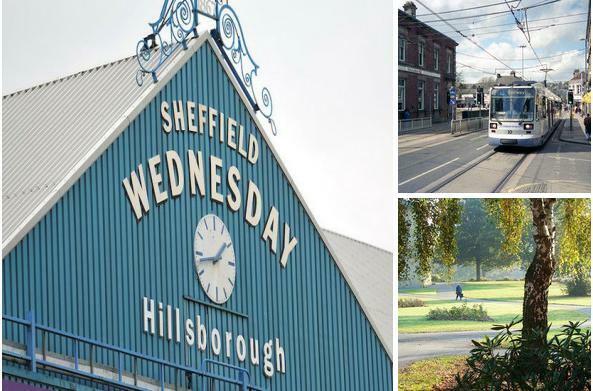 Hillsborough, a vibrant suburb of Sheffield, lies on the Sheffield Supertram's blue and yellow routes, and is home to a number of industries. A.L. Simpkin & Co Ltd on Hunter Road are a manufacturer of confectionery who have been established in the area since 1921. The district is also a shopping area, centred on Hillsborough Corner, which includes a variety local amenities an array of shops, restaurants and bars. Josh is the Lettings Manager at Reeds Rains Hillsborough. Having 6 years+ experience within the lettings industry he thoroughly enjoys working along side landlords and tenants finding suitable homes and providing excellent customer service. Gemma is the Branch Manager at Reeds Rains Hillsborough. Having 7+ years experience, Gemma can guide you through the ever changing world of estate agency. Stephen is an Embrace Financial Services Senior mortgage consultant with 23 years experience within the industry and many financial services awards to his name. Stephen can help guide you through the ever changing world of mortgages and the whole buying process.